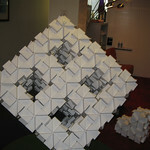 So we got a hold of a pallet of Jef Raskin's Bloxes (as created by Asa, his son) and we built around 200 of them. It was a fun thing for us to do while catching up with each other in Chicago during our team meeting. I've uploaded a gallery of images of the fun we had. Bloxes are pretty neat and remarkably strong. Only one caveat: Nothing worse than a cardboard paper cut. I'm all healed now, mind you, but watch your fingers. No one likes a papercut or a bloody blox. What a day! We announced the organizations that we selected to take part in the Summer of Code today. This is the culmination of days of review, looking at over 500 organizations. This was an incredibly hard thing to do. This year the quality of the applications was incredibly high. So high in fact that we chose to take on a good 30+ new organizations, but we still had to turn the majority of the applying organizations down. The program is only so big, after all. One of the unfortunate disappointments of the Summer of Code is how few large companies have taken on this model of large scale, broadly expansive open source benefit. I'd like to see companies that benefit so much from Open Source from open up the kitty and run similar programs. I'm not going to name names here, but there is a lot of companies saying they love open source, but seem to only look after a very small number of projects, and for very little actual larger impact. I won't lie, the Summer of Code could be seen as expensive, for sure. Google will spend over 5 million dollars on it this year alone, but it represents a terrific way to support the overall ecosystem of open source development. At the very least, there are three more seasons wide open for this if other companies would like to run similar programs :-) Combined with our other open source programs, including generating millions of lines of code since its inception, and hosting 80,000+ projects, I'm really proud of our work as a company in the open source world. Which brings me to recent comments from folks at Funambol and a few others online. The argument goes like this: Since Google doesn't support their pet project/license or whatever, we are abusing open source. This is ignorant at best and pathetic at worst. Mind you: I think it is okay to say that you'd like us to give back more, or release some piece of technology, as it is natural to want this, but to then say we are abusing the GPL or some of other license is absurd. I'll say this: People who use the words "ASP loophole" need to go back and read , carefully, the 2 most recent versions of the GPL. There is a reason there is no expansive language that would preclude ASP use of these licenses without incurring the need to redistribute code. The reason is that once you define distribution as web performance, or performance via a network port, it is difficult to understand where the redistribution requirements end. This means that simple tcp/ip communications over the internet, REST and AJAX calls could be considered infecting in an expansive reading of the license. In 10) Each time you convey a covered work, the recipient automatically receives a license from the original licensors, to run, modify and propagate that work, subject to this License. In 13) Notwithstanding any other provision of this License, if you modify the Program, your modified version must prominently offer all users interacting with it remotely through a computer network (if your version supports such interaction) an opportunity to receive the Corresponding Source of your version by providing access to the Corresponding Source from a network server at no charge, through some standard or customary means of facilitating copying of software. So I would say that these concepts and specifically when conveying is distribution need some annealing before we consider the AGPLv3 an understood license. We should see how the proponents of the AGPL (primarily SaaS vendors and the like) interpret these clauses and what they expect of the users of this software. In short: I think the AGPL needs work or more history by a much greater number of adopters before I consider it usable. To wrap up open source talk, one last thing: a pet peeve, GFS is a userspace filesystem, for cripes sake, not a kernel filesystem. See section 2.3 of the GFS paper if you care to read more about the design of GFS. It is an awesome paper. I got a tour today of the laser bays, target area and the rest at the NIF. It was so cool. That's really all I have to say about it. Wow. It is such a remarkable project. I mean, holy crow, it was so cool. That's all. ˙ɥɔuı ɹǝd sʇop uı uoıʇnlosǝɹ sʇı ƃuıɹǝpısuoɔ uǝɥʍ 003 ɹǝqɯnu ǝɥʇ ɥʇıʍ dıɥsuoıʇɐlǝɹ pɹnsqɐ ɐ sɐɥ 'ǝuo uʍo noʎ ɟı 'ɹǝʇuıɹd ɹnoʎ 'ǝɔuɐʇsuı ɹoɟ ¿ƃuıǝq oʇuı ǝɯoɔ spɹɐpuɐʇs ʍoɥ oʇ ʇɥƃnoɥʇ ʎuɐ uǝʌıƃ noʎ ǝʌɐɥ ˙dn ǝpıs-ʇɥƃıɹ ɹoʇıuoɯ ɹnoʎ sı ʎɥʍ ʇnq 'uʍop ǝpısdn sı ʇsod sıɥʇ ʎɥʍ ʇou sı uoıʇsǝnb lɐǝɹ ǝɥʇ. We've got some -amazing- groups who have applied, but I wanted to give the ol' internet one last ping. If you are a -currently- shipping organizations with a community that can readily welcome newcomers, consider applying for the Summer of Code.